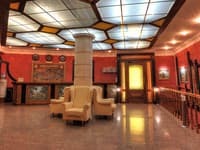 Spa Hotel "City Holiday Resort & SPA" is located in a picturesque area of ​​Kiev. 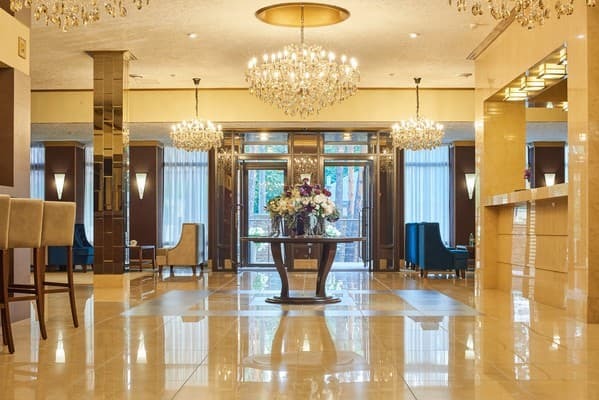 The hotel is an elegant multi-storey building with an exquisite design. 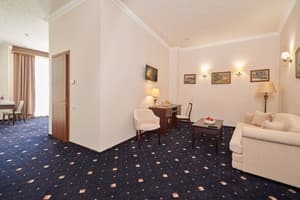 The number of rooms is 62 rooms, which are decorated in a modern style and equipped with all necessary furniture and appliances. 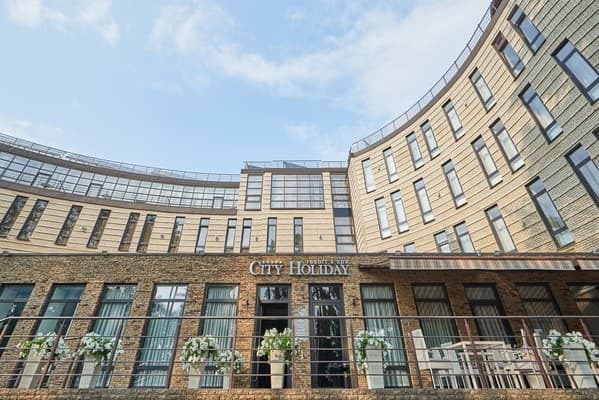 The spa hotel "City Holiday Resort & SPA" provides hot and cold water 24 hours a day. Each room has an individual bathroom and is provided with a hairdryer, bathrobe, slippers and towels. The reception is open 24 hours a day. Free Wi-Fi is available throughout the hotel's City Resort Resort & SPA. For guests who come by their own transport there is a free guarded parking. You can taste dishes of both European and traditional Ukrainian cuisine in the restaurant, which is located on the territory of the hotel. On request, guests can book breakfast in their room at an additional cost. Also in the lobby of the hotel "City Holiday Resort & SPA" is the Lobby Bar. Relax and relax guests can by the outdoor pool. For business meetings there is a conference hall, for more solemn events - a banquet hall. For an additional fee and on a preliminary issue, a transfer service can be arranged. The distance to the railway station is 11.8 km; To the airport "Borispol" 44,4 km. Description of the room: One-room cozy room, 25 m2 for comfortable double accommodation with all amenities. Stylized interior in dark beige tones, combined with exquisite furniture. Room is equipped with a working area, a seating area and a large double bed. Description of the room: One-room cozy room with a beautiful view of the city, an area of ​​25 m2. The room has a large double bed. Description of the room: One-room cozy room with an area of ​​25 m2 for a comfortable double occupancy with all amenities. Stylized interior in dark beige tones, combined with elegant furniture. The room is equipped with a working area, a seating area and a large double bed. 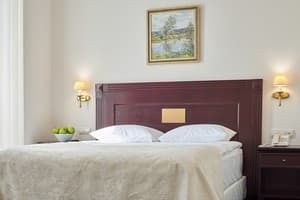 Description of the room: Spacious and comfortable room with a beautiful view of the city and the park area of ​​30 m2 for double accommodation with all amenities. Stylized interior in light beige tones, combined with exquisite furniture. The room is equipped with: a working area, a guest seating area, a large double bed, and a sofa. Description of the room: Spacious one-room with a kitchen area. The room has a beautiful view of the city, park area or swimming pool. The design of the elegant room, with an area of ​​36 m2 for double accommodation, is made in light colors, and the kitchen area is decorated with gold mosaic. The room is equipped with: a working area, a guest sitting area, a large double bed. In some rooms, the guest area is equipped with a sofa. Description of the room: Spacious and comfortable room, with a beautiful view of the city and park area of ​​30 m2 with all amenities. Suitable for 1-3 people (1 double bed + sofa bed). Stylized interior in light beige tones, combined with elegant furniture. The room is equipped with a working area, a guest seating area, a large double bed, and a sofa. 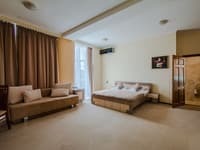 Description of the room: A large and chic room, with a designer interior in light colors and luxurious furniture, which combines: a bedroom, a working area and a recreation area. The room has a beautiful view of the park or city. The room has: a desk, telephone, 1 or 2 Full HD 32 "TV with satellite TV, WI-FI Internet, air conditioning, wardrobe, safe, mini bar, bathroom with accessories and bidet, seating corner, large double bed, sofa. Description of the room: Spacious one-room with a kitchen area. From the room a beautiful view of the city, park area or pool. The design of the refined room, with an area of ​​36 m2 for double occupancy, is made in bright colors, and the kitchen area is decorated with a golden mosaic. The room is equipped with: working area, guest seating area, large double bed. In some rooms, the guest area is equipped with a sofa. Description of the room: Large chic room, with a designer interior in bright colors and luxurious furniture, which combines: a bedroom, a work area and a seating area. The room offers a beautiful view of the park area or the city. Comfortably accommodates up to 4 people (1 double bed and 1 sofa bed). The room has a work desk, a telephone, 1 or 2 Full HD 32 "TVs with satellite TV, WI-FI internet, air conditioning, a wardrobe, a safe, a mini bar, a bathroom with accessories and a bidet, a seating area, a large double bed, sofa. Description of the room: A huge two-room suite with a rich designer interior, white furniture, panoramic windows and a large terrace. Luxurious design in light beige and gold colors, marble coverings and rich white furniture - will allow you to relax with unsurpassed comfort. The room has a beautiful panoramic view of the park and the city. Lux room class, with an area of ​​60 m2, is additionally equipped with two bathrooms, a large double bed and a sofa. On the terrace there is summer furniture. Check arrival: from 14:00 - 00:00 hours. Check leaving: to 12:00 - 12:00 hours. Children under the age of 5 years are provided a free cot. Children under the age of 12 are provided with an extra seat for an additional fee - 200 UAH per night. 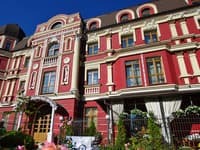 Extra bed for adults and children over 12 years old - 400 UAH per night. Maximum capacity of extra beds in a room is 1. 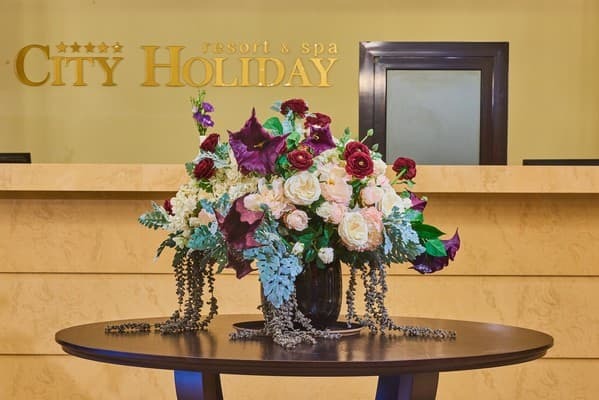 Spa Hotel "City Holiday Resort & SPA" is located in a picturesque area of ​​Kiev, 40 minutes drive from Khreshchatyk. 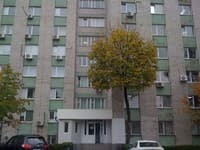 By public transport: to the metro station "Zhitomirskaya", then by shuttle bus №480, №716, №720, №721 to get off at the "electronic mash"